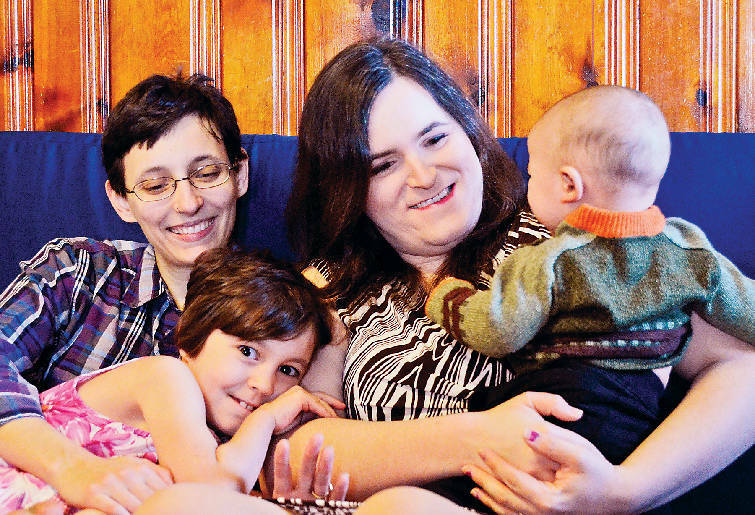 Meredith Russo, right, sits with her family, Juniper Russo, left, and children Vivian and Darwin in her East Lake home. New York-based Flatiron Books, an offshoot of MacMillan, is publishing Russo's first book, a young adult novel called "If I Was Your Girl." Russo says she is getting a $100,000 advance for the book, a number backed up by her editor at Flatiron who won't give an exact number but says it's six figures. Editor Amy Einhorn, who oversees Flatiron's YA division, is the same editor who found "The Help" by Kathryn Stockett and shepherded into print and the top of bestseller lists. It later became a movie that won a Best Supporting Actress Oscar for Octavia Spencer. Unlike Cinderella, Russo, 28, never relied on magic to change her life. Russo's success is due to talent, toil — she supported her writing career with unglamorous jobs ranging from dishwasher to call center aide — and courage. 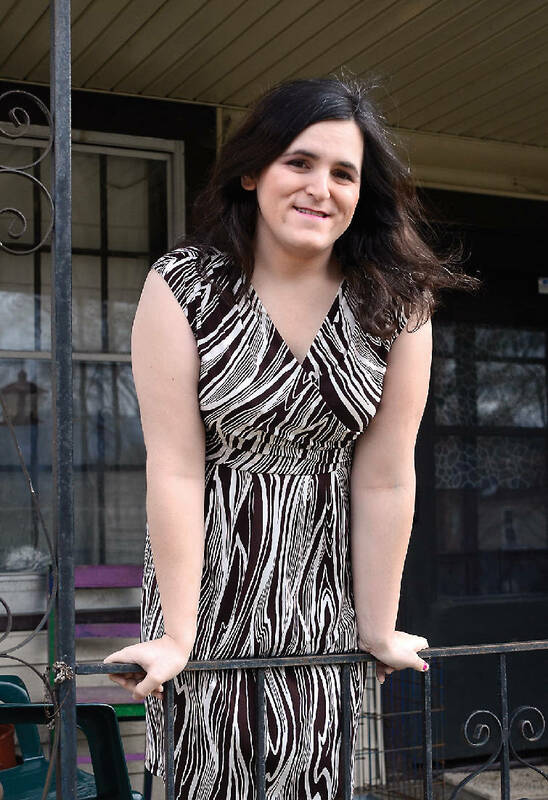 Russo, who grew up in Chattanooga, was born male and began living life as a transgender woman when she became an adult. "If I Was Your Girl" is about a beautiful, intelligent, blonde transgender teen girl who forms a loving bond with a straight male high school football player. The story is set in the Chattanooga area with descriptive details based on Rhea County, where much of Russo's family still lives. "It's strange because, even though I am so happy, I'm also thinking for the first time what it will mean to become a more public person who will be getting media attention because, well, there are some safety issues," Russo says. "When I was in middle school, some boys my age savagely beat me because they thought I was gay. Then as I got older and realized I was transgender, some of the most hurtful things ever said to me were said by the gay community. Many gays and lesbians do not accept transgender individuals as equals." Russo hopes her novel — which was bought by Flatiron after Russo submitted the first third of it to the publisher — will help transgender youth who feel alone and not accepted in any community by giving them a relatable heroine who is fun, interesting and empowered. She also hopes the plot will prompt transgender youths to use the book as a tool to plan for their next steps into the future rather than being trapped in an unfriendly present. "The heroine even gets a happy ending, which is a rarity for transgender fictional characters," Russo notes. Young adult is a booming genre in the publishing world and one where a new author can land movie and TV deals based on a book. Russo is working with Alloy Entertainment, a company that specializes in packaging books into multimedia franchises. Alloy produces such young-adult-aimed TV shows as "The Vampire Diaries," "The 100" and "The Originals," yet novels with transgender characters are a relatively new development for YA. "There were not many transgendered books, if any, until the '90s and they were adult novels," says Chattanooga Public Library Teen Services Coordinator Justin Hoenke, citing Patrick McCabe's "Breakfast on Pluto" as an example. "Before about 2004, the closest trans people got to being characters was the manga (Japanese comic book) 'Ranma 1/2,' where the character shifts sexes when touched by water of different temperatures," he says. "In 2004, the first transgendered YA book came out, 'Luna,' a novel by Julie Anne Peters. The book focused on how difficult it was for others to deal with someone else being trans. The book didn't give much from the view of a trans person." Hoenke and Tween/Teen Library Assistant Jessie Meyer found some novels with transgender characters after "Luna"was published, including "Parrotfish" (2011) by Ellen Wittlinger and "Freakboy" (2013) by Kristin Elizabeth Clark plus a handful of picture books for small kids. In Russo's case, her distinctive voice and Southern setting caught the eye of Flatiron editor Sarah Barley, an alumni of Harper Books. "I grew up two hours south of Rhea County in Huntsville, Ala., so the setting was a bonus for me, and Meredith describes it beautifully," Barley says. "What made me fall in love with the book was Meredith's voice and the characters she created." The book's young football player, for example, is not a stereotype of a high school dreamboat. His good looks and charm belie the fact that he works full-time to support a dysfunctional family living in a trailer park. And his athletic skills, he realizes, are not professional caliber but more of a youthful blessing. Russo counts herself lucky to have grown up with a supportive family. In high school, she found students and teachers who encouraged her at Chattanooga's Center for Creative Arts. Like most millennials, Russo is too frugal and skeptical of how the world works to spend her advance on a Fiji vacation or a Chanel shopping spree. The money comes to her in four payments, depending on where she is in the writing process. The one treat she might allow herself is electrolysis to remove facial hair. "The first quarter of the advance will be paid to me soon, so I can finish the book; then I get another quarter when I give them the completed book," explains Russo. "It's weird because it doesn't feel real yet. But when the third installment comes, I think I will take my spouse and children on a fun trip to New York City as a little vacation." Contact staff writer Lynda Edwards at ledwards@timesfreepress.com or 423-757-6391.